Is Washington Purposely Bleeding Syria? There’s growing evidence that the Obama administration is providing just enough aid to the rebels to sustain the war, but not enough to topple Assad. Almost three years ago, the late Pulitzer Prize–winning reporter Anthony Shadid sat down with Bashar al-Assad’s cousin and confidant Rami Makhlouf for an exclusive interview. The topic of conversation was Syria’s nascent uprising, which was then entering its third month. Makhlouf, a billionaire tycoon who had benefited tremendously from Syria’s economic pivot to crony capitalism, was a symbol of the excess and corruption that defined Assad’s Syria and was a prime target of much of the anger that had erupted onto the Syrian streets. “When we suffer, we will not suffer alone,” Makhlouf warned Shadid, a thinly veiled threat to those inside and outside Syria who dared to stand up to the Syrian regime. The regime considered its crackdown on dissent “a fight to the end,” he continued. Three months after Shadid’s interview with Makhlouf, President Obama declared that the “time has come for President Assad to step aside.” Despite similar proclamations from leaders across the Western world and countless predictions of its imminent demise since the start of the uprising, the Assad regime has survived. Three years later, it is clear Makhlouf wasn’t bluffing. Consistent with his early assessment, the regime has treated the conflict as a zero-sum game that could only be won through uncompromising military force. Far from collapsing, many analysts now believe the Syrian government has all the momentum in its fight against an increasingly divided opposition. Today, the distressing consequences of Makhlouf’s “fight to the end” have come into sharp focus. The latest estimates place the violent death toll since the start of the uprising at around 150,000. The destruction of the country’s healthcare system has led to thousands of additional preventable deaths. Dr. Annie Sparrow, a public health expert at the Icahn School of Medicine at Mount Sinai, estimates that the total death toll, including deaths due to lack of access to basic medical care, could exceed 300,000. A new report from Save the Children vividly illustrates the horrors unfolding daily. It documented cases of patients undergoing unnecessary amputation due to lack of necessary medical equipment, the death of newborn babies because of power outages at hospitals and even cases of metal bars being used to knock out patients as a substitute for scarce anesthetics. Moreover, the country’s vaccination program has collapsed, resulting in an outbreak of polio, a disease that had previously been eradicated in Syria. According to Save the Children, the country’s prewar vaccination rate of 91 percent dropped to 68 percent just one year into the conflict. It is undoubtedly much lower now. A series of UN investigations have revealed that these alarming realities were the byproduct of the systematic targeting of healthcare personnel and infrastructure by Syrian government forces and the intentional prevention of medical aid from entering contested areas. “Medicines are routinely denied to those who need them, including tens of thousands of women, children, and elderly,” says the latest report, highlighting the lack of progress since a binding UN Security Council resolution demanding the free flow of aid passed two months ago. Another investigation, conducted late last year, concluded that “government forces deliberately target medical personnel to gain military advantage by depriving the opposition and those perceived to support them of medical assistance for injuries sustained.… The situation is so dire that the general populace often elects not to seek [medical] help for fear of arrest, detention, torture or death.” The investigators also found that “some anti-Government armed groups have attacked hospitals in certain areas.” Thus, it’s no wonder that three out of five Syrian hospitals have been damaged or destroyed, and that half of Syria’s doctors have reportedly fled the country. Of course, doctors aren’t the only Syrians who have been forced from their homes. The most recent estimates are that 2.6 million Syrians have sought refuge in neighboring countries and an additional 6.5 million are internally displaced. 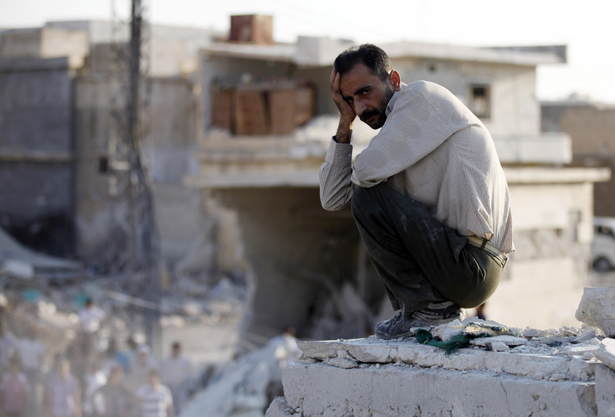 Thus, nearly half of Syria’s citizens have been dispossessed of their homes. Last week, the UN’s World Food Programme announced it will be cutting desperately needed food parcel deliveries in Syria by 20 percent because contributing nations aren’t fulfilling their financial obligations. Despite the shocking scale of the humanitarian crisis, the prospect of a resolution to this conflict is now more remote than ever. Hopes for a political settlement, pushed forward by Russia and the United States, amount to little more than a fantasy at this point. The latest round of negotiations, the much-touted Geneva II conference, ended after Assad’s representatives refused to even discuss the possibility of a transitional government. Moreover, the Syrian government arrested family members of the opposition delegation it was supposedly negotiating with in good faith. It was relatively clear from the beginning that these negotiations were destined to fail. The Syrian government, emboldened by its gains on the ground, believes that it is winning. It has refused to offer any tangible concessions since the beginning of the uprising, even in times when it was believed to be flailing. Why would it negotiate its own demise now, when it is brimming with confidence? With the unyielding support of Iran and its regional ally, Lebanon’s Hezbollah, along with a steady flow of weapons and diplomatic cover at the UN from Russia, the Syrian government is on the brink of declaring victory. Preparations are under way for a sham election that will grant Assad another seven-year term as president. In the last of these so-called elections, a referendum held in 2007, Assad supposedly garnered 97 percent of the vote with a turnout of 95 percent. As the UN’s special envoy on Syria, Lakhdar Brahimi, has suggested, this election will be the final nail in the coffin of any political solution to the conflict. The implication here is that the president of the United States could be seeking to intentionally prolong the war, despite the catastrophic scale of the death and destruction that is taking place as a result, because it is bad for Iran and Russia. As the Syrian people mark the beginning of the fourth year of their tragedy, caught in the middle of an international chess match they no longer have power to influence, one thing is abundantly clear: Makhlouf was right—the regime did not suffer alone. Omar GhabraTwitterOmar Ghabra, an independent journalist based in Seattle, has written for The Nation, The Atlantic, Al Jazeera America, Scientific American, and The Huffington Post.